I bought a 22 lb turkey today. Not for Thanksgiving but because they were on sale… I will pick up one more before the week is through. I need to get some stuff out of my freezer first. 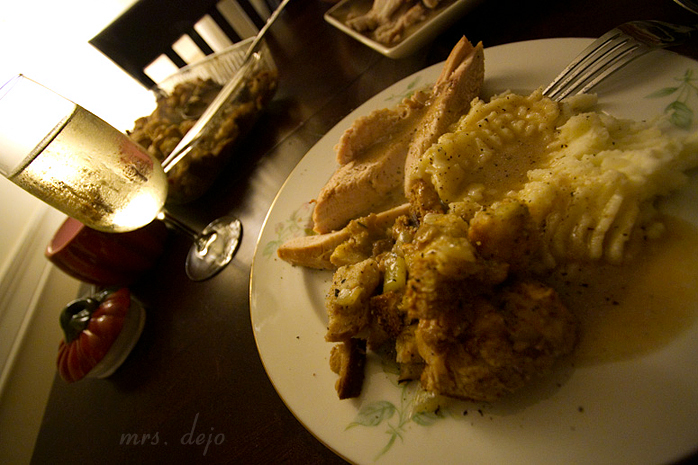 I cook turkey dinner more than the average person. If I didn’t hate bumper stickers, I would have one that says I heart turkey. Although I have never used these bags for brining, I will next time. It will fit in my fridge better and ziploc bags don’t leach poison:) I’m sure they are in most grocery stores. In a large stock pot, combine veggie broth, salt and spices. Bring to a boil, stirring occasionally until salt is dissolved. 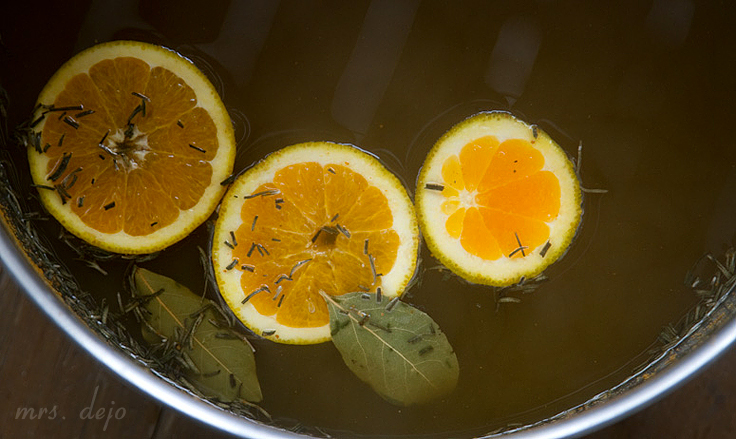 Remove from heat, add cider and oranges. Cool to room temperature. If you’re using fresh herbs, you can throw the stems in whole. Add the rosemary and bay leaf at the beginning. Add the sage and thyme after the salt is dissolved and you turn the heat off . Stir for an extra five minutes before you add the cider. Cool to room temperature. Combine the brine and ice water in a large enough (bpa free) container to hold 2-4 gal of liquid plus a turkey. I usually cook as big of a turkey as I can find. 22-25 lbs. I double this recipe. Place the thawed turkey (with innards removed) breast side down in brine. Make sure it’s completely immersed in liquid. Cover, and refrigerate or set in cool area if you’re using a cooler for 12 to 24 hours, turn the bird once half way through brining. Preheat the oven to 500 degrees F. Remove the bird from brine and rinse with cold water. Discard the brine. Place your turkey in a roasting pan. And prepare your aromatics. 32 or so oz of chicken broth. Add everything but the herbs to a microwave safe bowl and heat on high for 5 minutes. Add steaming aromatics to the birds cavity along with the herb sprigs. Rub the bird with 1 softened stick of butter. Sprinkle with some red and black pepper. Dump container of chicken broth in the bottom of pan so the drippings don’t burn. I only do this because my turkey roaster has a rack so the bird doesn’t sit on the bottom. It also helps with the gravy process. Throw it uncovered on the lowest rack in your oven for 30 minutes. After a half an hour insert a (oven safe) meat thermometer into the thickest part of the bird, drop the temperature to 350 and continue roasting. From now on rely on a meat thermometer. When the inner temp of the white meat reaches 165-170 and the dark meat is 180, take the bird out of the oven. Cover loosely with a sheet of foil and let rest for around 15 minutes. Brined turkeys cook on an average of a half-an-hour faster, keep that in mind. Like I said, I usually cook a big bird and I don’t think it’s taken longer than 2.5 hours. Rely on your meat thermometer! It is your friend…. In all the times I have cooked turkey, I have never gotten a good picture of the whole bird… oh well. May I just say, you’re the best!